Time to open a page for the Lagotto Romagnolo guys at Immer Essen. Several years back, we brought in young trees inoculated with truffle spores and planted 2 acres. Next thing on the list was bringing in dogs to find the truffles when they appeared. Enter Oz and Pooh, who were born in Italy and came to Immer Essen Farm in October 2015. They are very funny dogs, quite different from Corgis but extremely intelligent and super gentle. Add to this their hypoallergenic coat and eagerness to please, and you've got a great new Ancient Breed dog on the farm. We had a lot of experience in the need for testing in our 20 years with Corgis, so we started off with pups that had good testing behind them. Then we taught them English as a 2nd Language. As soon as it was practical, we also took them in for an Ophthalmology exam, which they passed and were certified as Normal. We received full documentation showing that both Oz and Puma are genetically clear for JD (juvenile epilepsy) and LSD (Lagotto storage disorder). We don't have any truffles yet, but we did take Oz and Pooh for scent training, and they did very well. So far, Oz seems more serious about the task - Pooh is a little more "Girls just want to have fun," although she certainly has a great nose. 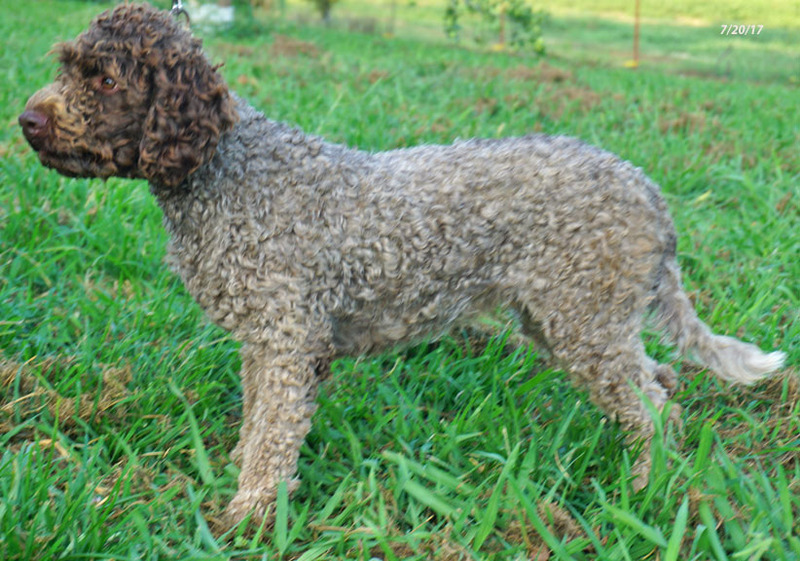 Our Lagotto's have not been shown, although both are good examples of the breed and have show parents. 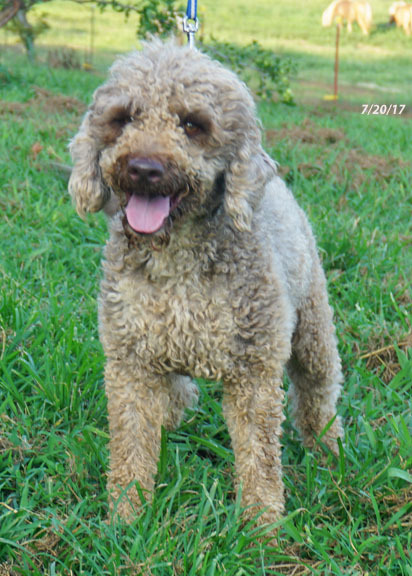 We don't have time for a lot of grooming, so pictures are going to show you Lagotto's with home-clipped coats kept short for comfort and our convenience. They do look cuter with longer coats. 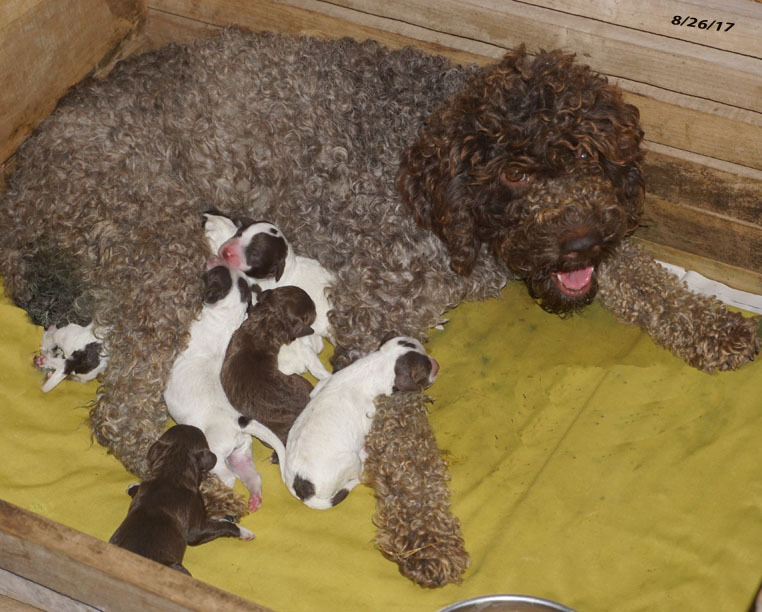 We had Lagotto puppies! Click here for pictures and pedigree and other information. 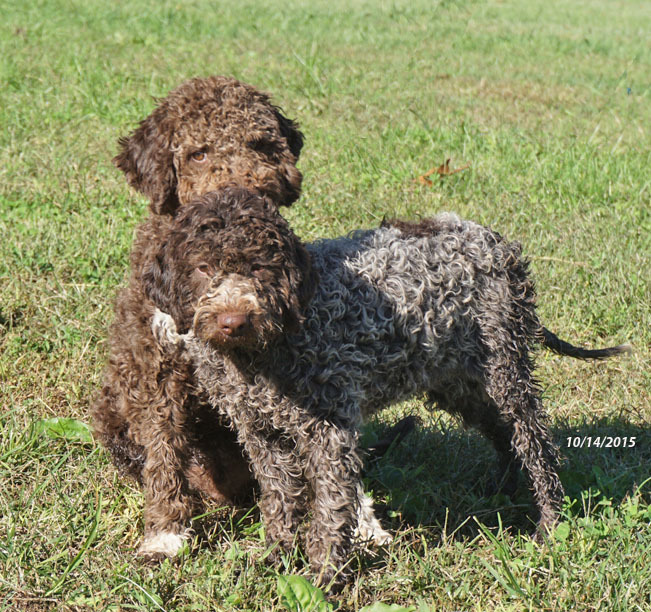 Please let us know if you would like to be considered for a Lagotto Romagnolo puppy - we will not be shipping, so pick up will be necessary. We are located midway between Knoxville and Chattanooga in Southeastern TN, about 15 minutes from the Sweetwater exit of I75. We are about 3 hours from Atlanta, Georgia; 2 hours from Nashville, Tennessee; and 3 hours from Asheville, North Carolina. We can be contacted at "imesfarm@earthlink dot net" - Cheers! Click here for Pictures, Pedigree and Testing Information.